Notice: The Tooth Zappicator has been DISCONTINUED in favour of the NEW Super Zappicator. Dr. Clark’s research and our own findings show that the Super Zappicator is an effective and safe, easier-to-use replacement for the Tooth Zappicator. In addition to zappicating teeth, the Super Zappicator can be used on food and to reach areas that the Zapper can not penetrate. Please see our SuperZappicator page for details. Although we no longer sell the Tooth Zappicator, we continue to honour our warranties and provide top-notch service and support for all of our customers. Our Tooth Zappicators are precision instruments, manufactured to exacting specifications developed by Dr. Clark. Please treat them gently! We’re glad that you like our Tooth Zappicators so much. They are the sturdiest, best unit available, but they are still delicate. Every one is made with extreme precision and care, and has been individually tested for phase alignment and magnetic polarity. PLEASE be extremely careful. Do not attempt to take it apart or treat it roughly. We have seen some tooth zappicators come back for repairs, and they look like the dog has found a new toy. Please be gentle, do not use the zappicator like a tooth brush – pressure is not required! – and it should last a lifetime. We now have the professional Tooth Zappicator, as described by Dr. Hulda Clark in her latest edition of “The Cure for HIV and AIDS,” page 232. It is a high quality tubular handle with a specially tested and selected North Pole magnetic speaker on the end. The Tooth Zappicator is ruggedly built, and wired to ensure correct North polarization when hooked up to the Auto-Zap zapper as shown above. 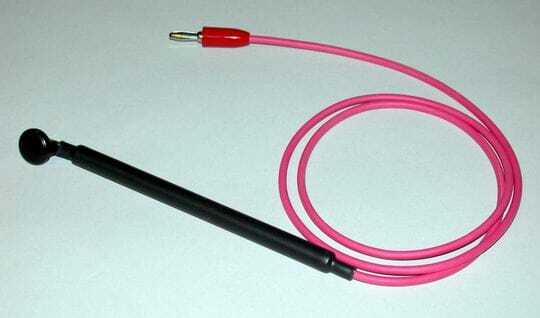 We can also supply the proper connectors and 1 kHz keys for the “Dr. Clark” SuperZapper models. If you want one to fit the SuperZapper or similar, note that on your order in the Notes box. Our tooth zappicators are the only ones we know which have both correct magnetic polarity AND electrical polarity. We also include a unique test connector to allow you to verify that the zappicator is wired properly and working, if you have access to an ohmmeter or digital tester. The Zapper is not included, but you can purchase the Zappicator with our Zapper and save. A tooth zappicator is a small North Pole speaker fastened to the end of a toothbrush. 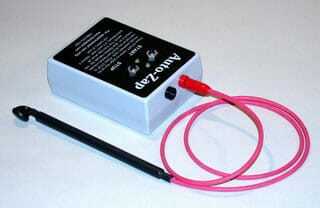 The speaker is attached to your food zappicator circuit (the 1000 Hz zapper)[or Auto-Zap 2500 Hz zapper]. The tooth zappicator is then held in place on top of the tooth ridge for three to five minutes. A surge of immune power is induced, which removes lanthanides, other metals, solvents, plastic remnants and bacteria all at once. You should have taken germanium, selenite and vitamin C beforehand. If you have locations in the jawbones that appear infected or “soft” on your X-ray, treat them next. They will have bioaccumulations of old toothpaste, mouthwash, dental impression compound, etc. Treat the whole tooth ridge, a segment at a time. Repeat on inner and outer surfaces of the gums, making three sets of treatments altogether. Don’t miss the remaining teeth themselves. Even when you are not able to search for them first, most hidden cavitations can be systematically cleared by zappicating the whole upper and lower jawbone. Do it yourself to be sure it is thorough. After three zappicating treatments the plastic teeth no longer seep dyes, and the stray amalgam that has saturated the tooth will be chemically changed so it can be removed by the immune system. Tattoos are not removed. Only a North Pole force coming from the loudspeaker has this effect. Be sure to test the polarity of the loudspeaker with your compass before using it. There are no side effects but remind yourself of what you are doing: chasing all the metal, plastic and bacteria into your white blood cells and to the kidneys for excretion. Help the process with germanium, selenite, vitamin C, kidney magnets and a lot of fluid to drink. The tooth zappicator can also be used to harden plastic. For this purpose, press it against plastic teeth or teeth with plastic fillings. Give five minutes to each location, then take a break for at least one-half hour. Repeat a second time on inner surfaces. Take another break, and repeat a third (and last) time on outer surfaces. The effect is permanent. Ideally, each newly zappicated tooth is now tested with the dental Syncrometer probe for unconsumed (not hardened) plastic, amalgam metals, or clostridium bacteria. Resonance with urethane, phthalate or bisphenol-A implicates unhardened plastic. Resonance with platinum, palladium, thallium, or mercury implicates amalgam. Note that even the tiniest brown spot tests POSITIVE for Clostridium. Try to polish it away with baking soda or emery cloth. If you can’t, go back to your dentist for assistance. Do not have these tiny infections filled afterward. But brush with oregano oil tooth powder and Dental Bleach alternately. Zappicating the teeth does not remove the amalgam remnants still all over your mouth soft tissues. The tooth zappicator can also remove them. Give five minutes to each small area, everywhere you can reach with the zappicator. Taking L-G helps during this procedure. Do not zappicate teeth and mouth on the same day. It could overburden your immune system or give you detox-illness. In the past, I recommended EDTA, DMSO, and vitamin C as a mouthwash for the final cleanup of amalgam from your mouth. They are not nearly as satisfactory as your body’s own L-G. L-G was evidently meant for removing heavy metals, because the body can do it by itself without leaving a molecule behind, and do it quickly provided L-G is present. It takes about five days for L-G to clear your mouth after first zappicating it, then six weeks to clear most of your body. This beginning Home Dentistry is a creative innovation of huge significance. Being able to do home dentistry, using the Syncrometer to guide you, may pave the way to caries prevention that has eluded us for so long. You can find a tooth infection long before it becomes a cavity. And you may be able to clear it up with dental zappication and diet changes. You are also able to clean up after amalgam removal yourself. You can stop seepage from plastic, and keep Clostridium away. Your mouth is finally metal-free, plastic-free, dye-free, and Clostridium-free. It is a huge accomplishment. There are different opinions among dentists about when to make an impression of your mouth: before tooth extraction or later after your mouth has healed. Choose before or wait 6 months! Never let impression compound be put in your mouth earlier or unnecessarily, such as for “bite registration.” Other means are available for this. The toxic chemicals put in your mouth to make the impression and for fitting and adjusting are absorbed and travel to the brain. Mental deterioration from the huge doses of aluminum, dyes and silicone absorbed often begins the same year! When impressions are made before extraction your replacement teeth can arrive much sooner. The fitting is done as soon as your mouth is healed enough to tolerate it. All the more motivation to do the Dental Aftercare correctly so no post-infection could delay fitting. Of course, the mouth will change slightly as it heals further. Adjustments will be necessary a month or so later and at future times. Adjustments should be made without impression compound. In a few cases, when entirely new dentures or partials are required, choose a safe variety of impression compound, described on page 135. There are many kinds of denture materials. Methyl-methacrylate and polyurethane can be hardened by you at home and are therefore good choices. They will be safe from seeping, even if a pink color is chosen. Other materials hold promise but need more research. See “Hardening Dentures” in Recipes. You have completed the hardest task required to raise your CD4 cells and lower your CD8s while increasing their total number. You have removed an assortment of about 50 heavy metals that were blocking and destroying your lymphocytes, neutrophils and macrophages, namely most of your immune system. You have removed an assortment of azo dyes that were contributing to this. And you have evicted Clostridium from its fortress in your teeth. A glance in the mirror shows you a beautiful set of teeth, sweet-smelling breath at all times, and chewing better than before. You have enabled your body to survive. Of course you have done a lot more than just clean up your teeth! You have removed heavy metals, dyes, and Clostridium from all of your mouth — your cavitations, your salivary glands, and your throat. The next step is to remove these same pollutants from your diet and environment, so all your specialized white blood cells can go to work for you again. This only takes days, not weeks. You might be wondering how much it will cost for this very specialized dental clean up. Although the dental work may seem straightforward, extractions being very common procedures, the way you need them done is not at all common. Using homemade antiseptics, requesting cavitation cleaning and tattoo removal, and finding a dentist with digital X-ray equipment are all non-traditional. In Mexico, in 2003, the rate including the cleanups was about $85.00 per extracted tooth. Full dentures cost about $450.00 – $500.00. Dr. Clark informed us that a low frequency (1 kHz) zapper is more effective with the tooth zappicator than a 30 kHz unit. When I asked her about using our AutoZap at 2.5 kHz, she said it would work very well. We test each Tooth Zappicator rigorously to ensure that it has the correct polarization specified by Dr. Clark, and cover it with a 5 year parts and labor warranty. Because of the personal nature of this item, it cannot be returned for refund once shipped.